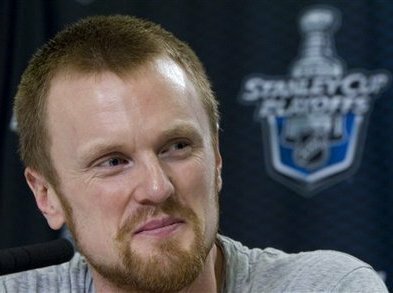 After Game 7 of the 2011 Stanley Cup Final between the Vancouver Canucks and Boston Bruins, we spoke with captain Henrik Sedin about the series and his post-game conversation with the officials. These are his stories. Q: How disappointed were you on a personal level not to contribute more during the Stanley Cup Final? A: Yeah. It’s our job to score. It’s our job to step up and we didn’t do it. So it’s extremely disappointing. Q: What did you say to the referee at the end of the game when you shook is hand? A: Ah, I’m proud of those guys. They did a great job game in and game out. You have to be respectful. They have a tough job. They get a lot of stuff from the players and coaches. It’s a tough job and they’ve been great. Many thanks to Henrik for speaking with us. Best of luck next season.